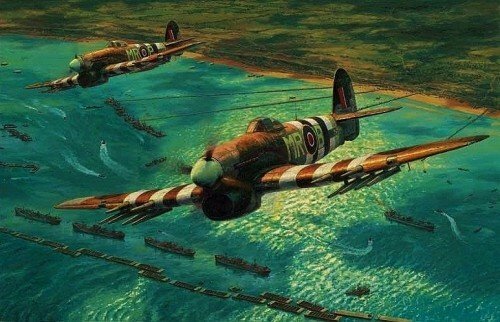 As the first rays of dawn broke over Gold Beach on the morning of 6 June 1944, twenty- three Halifax bombers from 76 Squadron headed inland over the breaking surf below. Their task: to annihilate the large German coastal gun battery of Mont Fleury that overlooked the beach where elements of the British 50th Division would shortly be landing. 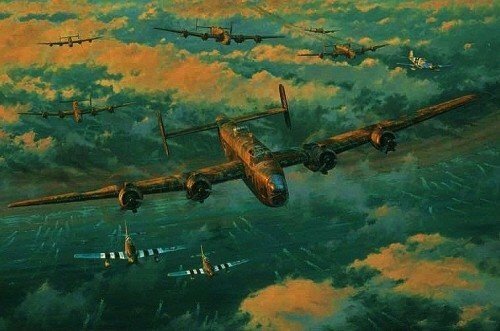 Anthony Saunders’ superb painting catches the moment as the Halifaxes, now escorted by American P-51s of the 359th Fighter Group, survey the extraordinary sight unfolding below them. Carried by a vast flotilla of landing craft, the first assault brigades of the 50th Division steam towards the Normandy shore where, despite heavy initial opposition, the British forces soon broke through. By midnight the 50th Division had landed over 25,000 men, and linking up with the Canadians on Juno Beach, had secured a deep bridgehead along a six mile front. The Battle for Caen and their long, slow march to Berlin had begun. Each print has been personally signed by three aircrew who flew on Halifaxes throughout Europe. Every print is endorsed by the artist and hand-numbered.